Inspired by the Tamil Nadu Chittirai festival, the central concept is universal motherhood. The pandal has touches of the temple, architecture, dance forms (Kabadiattam) of Tamil Nadu. They have put forward the social message of the ironical treatment of mother as a goddess and mother as a captivated household member. Noteworthy is the idea of ‘Akalbodhon’ by collaborating Ram and Ravana together. This Puja has tried to uphold the message of women power as well as the power of creation is also being celebrated. The use of stark red and blue colours inside the pandal reflects an eternal clash between two primal forces, i.e., Shiva & Durga, which is essential for every creation. The Goddess does not have any traditional Asura here, instead she is standing over Lord Shiva which again reveals the underlying tone of creation. Interestingly, both the interior and the exterior of the pandal have been curved out of recycled materials, including tin drums, metal shutters, steel spoons, mosquito nets etc. The main theme is around the dichotomy of the girl as a commander before marriage and as a caged, enslaved entity after marriage. Using scrap metals and video projections, they have beautifully portrayed the irony of treatment of women in routine life and as a goddess. Using subtle lighting and dark wood furniture, the concept came through very effectively. Celebrating 50 years, they have depicted mother goddess as the epicentre of Samudra manthan of which the eternal fluidity of life(amrita) and death(vish) has emerged. Using biodegradable materials like coir and embroidery cloth, they have presented the theme inspired from mythology. The pots and metal wires have been connected to symbolise the womb and the ever continuity of life. The theme this year is to raise a voice against use of Genetically Modified Organisms (GMO). Goddess Durga has been depicted in the form of Hybridashuromardini and she is leading the fight against the use of GMO. A Devil’s Workshop has literally been created in the interiors, which signifies the catastrophic efforts of hybridization and cross-breeding to mankind and the overall ecosystem. There is a distinct inspiration taken from Sukumar Ray’s iconic TyanshGoru. One can spot a banana with the face of a fish, a sheep with the body of a kangaroo and a hippo peeping out of a kangaroo’s pocket. In line with their theme, they have not used any plastic for the construction of their Pandal this year. Maa is coming. And the entire city is dressing up to welcome her. so let’s make our homes their best too. Give your walls the festive look with Durga Puja pattern and win exciting prizes. Last date of entry is 1st October, 2015! Please call +91 8336925413 for any further queries. 1.THE JUDGEMENT OF THE JURY IS FINAL AND BINDING. 2. ASIAN PAINTS INDIA LIMITED RESERVES THE RIGHT TO DECIDE WHETHER THE PUJA FALLS WITHIN THE GEOGRAPHICAL BOUNDARY LIMITS OF THE COMPETITION ( AS STATED IN THE MAP ENCLOSED). Asian Paints Sharad Shamman Year 2014. Congratulations to the winning Pujas for Asian Paints Sharad Shamman 2014: Shreshthho Puja – Behala Buroshibtala Janakalyan Sangha, Kankurgachhi Jubak Brinda Sarbojanin Durgotsav, Suruchi Sangha : Bachhorer Bismoy – Netaji Jatiya Sebadal; Shreshthho Protima Shilpi – Gouranga Kuila for Abasar Sarbojanin Durgotsav: Shreshthho Protima Shilpi Bachhorer Bismoy – Kanchi Pal for Kalighat Nepal Bhattarcharjee Street Club. This year’s theme has been chosen as “Ganga my Mother” wherein her children are desperately crying out for help and protesting against her rampant pollution. The entire puja is a sight to behold! The goddess has arrived to her ailing children in a massive wooden vessel made of “Shirish” wood brought in from Orissa. The waves in the Ganges are portrayed as hands reaching out for help against the menacing problem of water pollution. The vestibule has been cleverly re-imagined to portray the clean underwater environment which the goddess will help bring back accompanied by sounds of lapping water to fill in the somber mood. Goddess Durga is depicted to be seated amid the waves of Ganges where she quells the demon of pollution and revives the vigor of the river for her children in much aplomb. In a bid to portray the ancient Ratha Yatra of Puri where one part of Goddess Durga’s organs had fallen, Kankurgachi Yubak Brinda has made their theme “Ekbar Jagannath ke Dekh” (Look at Jagannath once). Ratha Yatra is one of the most significant festivals of the country and various people across the world come here during this time and try to touch the holy chariot once to have salvation. 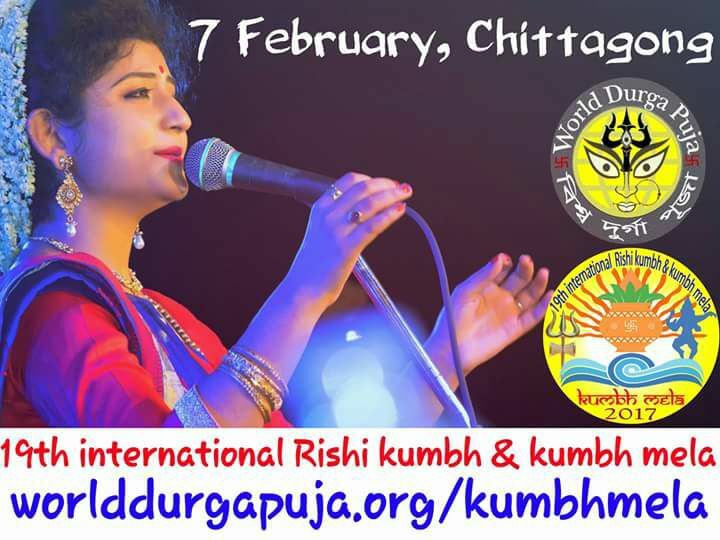 Representing this wonderful event; the puja displays some processions of Brahmins along with the rally of common men who come along to see the divine semblance of Jagannath. Maa is here worshipped at ‘Rather Mela’ where the people overwhelmingly pour in to get the flavor of Goddess of power amidst the inexplicable bonhomie of people. This year’s theme is twofold – encompassing world peace along with the cultural and artistic brilliance of Chattisgarh. The artisans of Chattisgarh have meticulously hand crafted wrought iron metal work as well as intricately hand-carved wood. Goddess Durga has been depicted with only two hands to honour the Chattisgarh tribal tradition of worshipping their human ancestors. The deity is placed in the centre of all creations of the universe enhancing her spiritual significance. Figurines made of “papier mache” (a mixture of glue, water and paper) portraying people of all races holding hands; conveys the message of world peace. There is always a connection between the human and the gods and that connection is well portrayed with strings this year by Netaji Jatiya Sevadal. The main puja is covered by colorful wools. The interior of the puja has astonishing designs made up of strings. 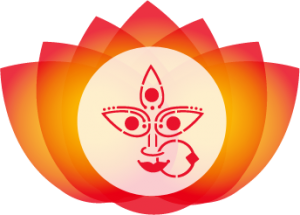 A lotus is placed at the centre of the puja which signifies the four aspect of life itself: sound, color, light and water. Different strings comprising of wool, cotton, etc have been used to give effects to the puja. Moreover, the background music adds a more celestial effect in the puja. 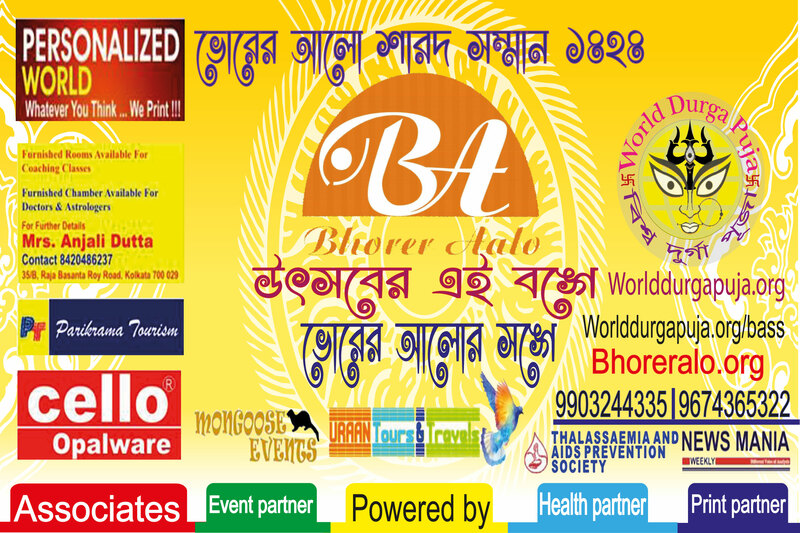 A culture which is on the verge of extinction is taken forth by Kalighat Nepal Bhattacharjee Street Club this year. 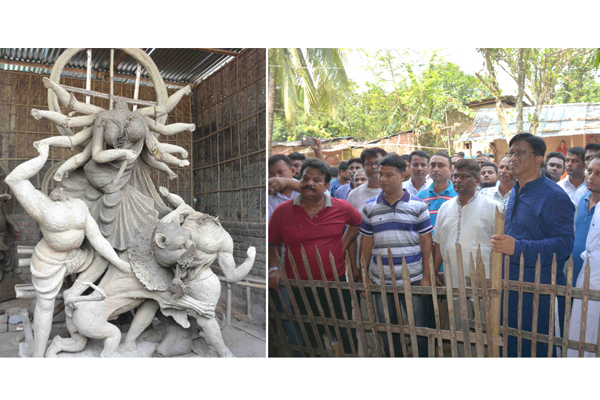 A village near Birbhum, Daronda has been depicted through this Puja where a tribe lives and worships Goddess Daronda. Inspired by their lives; the members of the club tried to portray the life of those people. The idol is having an essence of immense simplicity as village life has been depicted in the puja. With the growing urbanization and commercialization of every aspect of our life this year Abasar Sarbojanin Durgotsav Committee came up with a contrasting idea. They have depicted the life of tribes and their way of celebrating the festival. 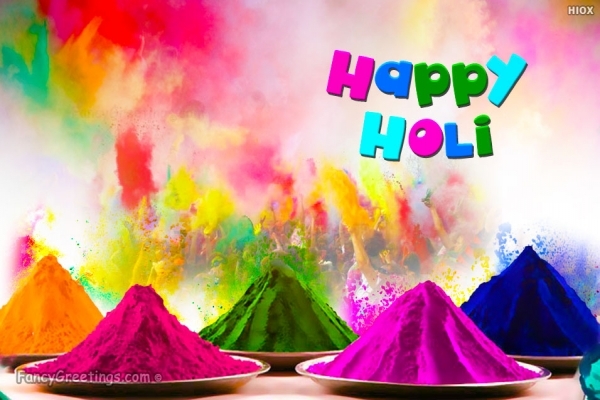 Humans, animals and birds come together to rejoice the festival. They have used various elements like wooden benches, pipes, coconut shells, to make the abstract look of the humans and animals. Birds are made up of ceiling fans which is a piece of enthralled art. The main puja is decorated with all those abstract living beings. An alumnus of Government College of Arts, Kolkata, Samir Mondal is well known for his creative mastery in watercolour painting. While using water colours, he developed textures and structural features as if they are oils. He has held numerous solo shows and participated in many important group exhibitions in major cities around the world. A prominent Indian classical vocalist. She is the daughter of Chandana Chakraborty and the renowned Indian classical singer Ajoy Chakraborty. She has participated in many major concerts, including the Dover Lane Music Conference, the ITC Sangeet Sammelan in India, the Spring Festival of Music (California), and Parampara Program (Los Angeles). Director, screenwriter and actor in Bengali cinema. Received ‘National Film Award’ for Best Feature Film in Bengali: ‘Shabdo’ in 2012, and ‘Best Director’ Award for the movie ‘Apur Panchali’ at the International Film Festival of India (IFFI) Awards in 2013. Popular Bengali film actress. She started her career with dancing reality show Naach Doom Macha Ley. Then she worked in several films of which Awara became a box-office hit 2012. Highly acclaimed commercial photographer from Kolkata. Worked with almost all the top advertising agencies of this country (JWT , Ogilvy, Reddifusion, Lowe Lintas, Bates Asia to name a few), worked for innumerable clients from Tata, UB, P.C Chandra, Reliance, ITC, Exide, Khadims, Exide, Greenply and many more. In Ultadanga Pallyshree’s words, “Peace is not an option – it is the compulsion of the time”. While the world is shivered with wars, Ultadanga Pallyshree has permeated the message of peace and upheld the necessity of eternal tranquility. The colour white has been used as the symbol of peace and the Goddess is here in an optimum serene mood just after killing the demons of the time. They have displayed the chaotic and unplanned situation of the city despite which the residents are residing in peace- the multistoried, standing tall beside the slums and thus, the beauty of natural peace emanates from its aura. Vanquishing the evil power Maa has the tranquil guise accessing toward spiritual salvation. These will be chosen from the 10 shortlisted pujas. The puja might or might not be an Asian Paints Sharad Shamman winner under any category , in the previous years. Best puja among those which never won the Asian Paints Sharad Shamman Award under any category , in the previous years. This will be chosen from the 10 shortlisted pujas. This will be chosen basis the idol of the 10 shortlisted pujas. 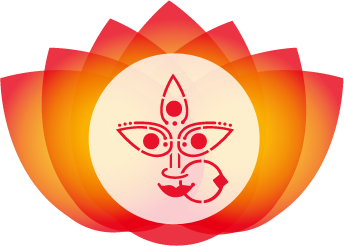 This will be chosen from the additional 2 shortlisted pujas – over and above the 10 pujas shortlisted. The award will be given to a new artisan of Idol (idol maker), who has never won any Asian Paints Sharad Shamman winner under any category , in the previous years. The puja associated with this artisan must also be a puja which has never won any Asian Paints Sharad Shamman winner under any category , in the previous years. The final scores will have 50-50 weightage of the Supervisors score and the Judges score. 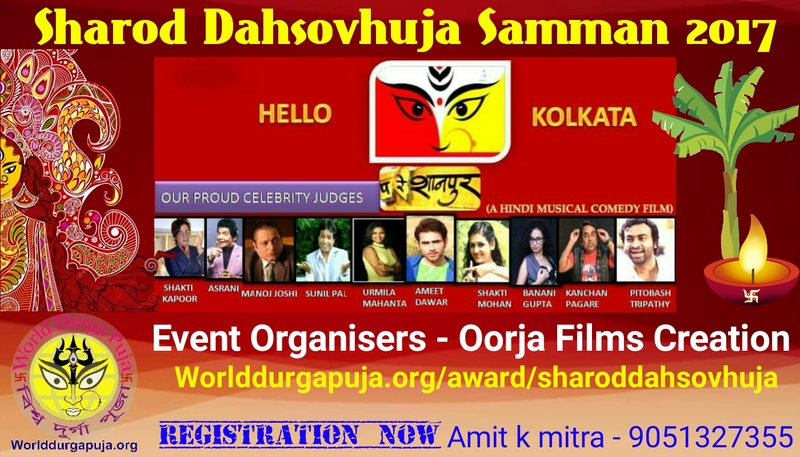 * Please Note – This award has been introduced in 2013 to encourage new talent (artisan) and exposure to a new Puja . 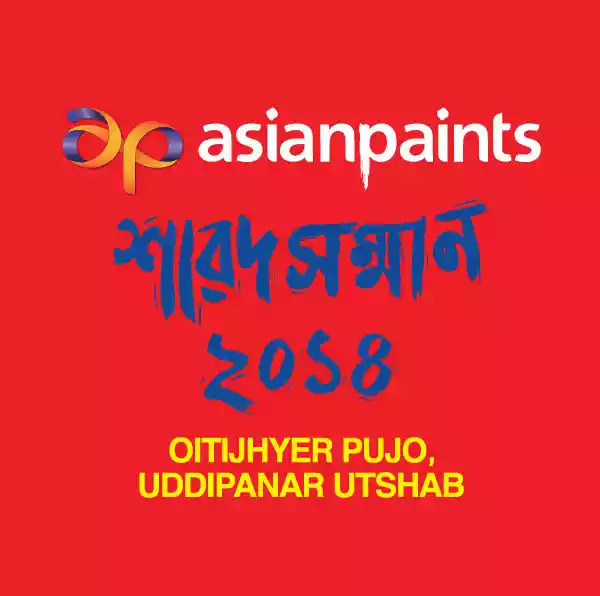 If in a certain year , the entries competing in this category are found to be lacking the excellence standards of Asian Paints Sharad Shamman then we reserve the right to not declare any winners under this category , for that particular year. Just over a century ago, twelve friends in Kolkata got together to organise the first Baroari (‘baarah yaar’ or ‘twelve friends’) Puja, that took the Durga Puja celebrations to the community at large. Neighbourhoods (paras), clubs and local committees today contribute to about 3,700 Sarbajanin (‘for all people’) Puja celebrations in pandals (temporary structures that house the idols) across Kolkata. From a festival celebrated at home by the land-owning elite, the pujas have become a common man’s festival. 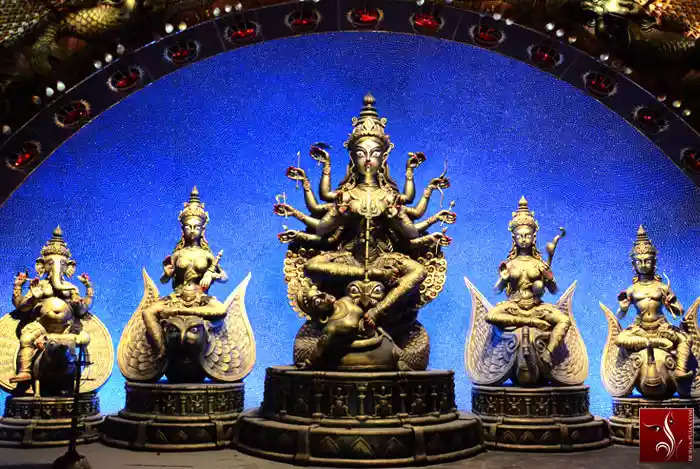 Cut to twenty-seven years ago, a seed of an idea discussed over lunch by advertising pros Derek O’Brien and Sumit Roy, and poet Subhash Mukhopadhyay, led to the instituting of the Asian Paints Sharad Shamman Awards to honour the three best pujas or Shreshtho Pujas. 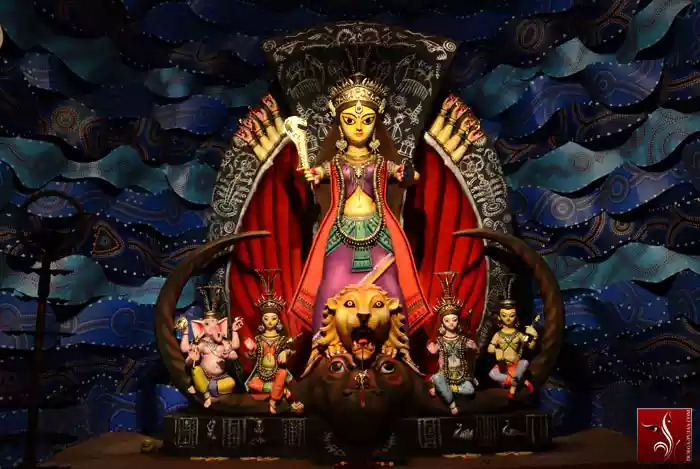 In time, this would also include one pandal each for Discovery of the Year (Bauchorer Bismoy), Innovative Excellence (Nobo Nakshi), and Best Idol Maker (Best Pratima Shilpi). The awards, facilitated by Asian Paints, sought to create a renowned and reputable platform of expression for both all strata of society. 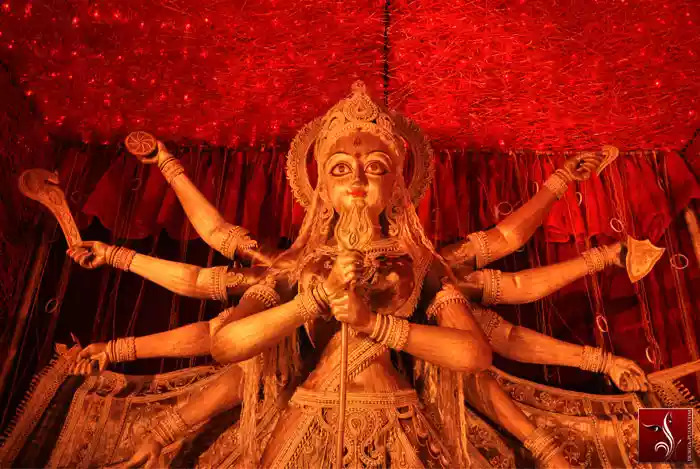 Pujas started becoming more culture-conscious as Rabindrasangeet and Vedic mantras replaced Bollywood music, and traditional idols made a comeback. More importantly, it ensured that musical forms, traditional arts and crafts, and community celebrations imbibed with religious fervour, all remained intact in the face of commercialism over the years. Adi Ballygunge – One of the three pandals to win in 1985, the first year of Asian Paints Sharad Shamman. Interestingly, the traditional art forms evolved as the puja celebrations became more inspired and innovative. 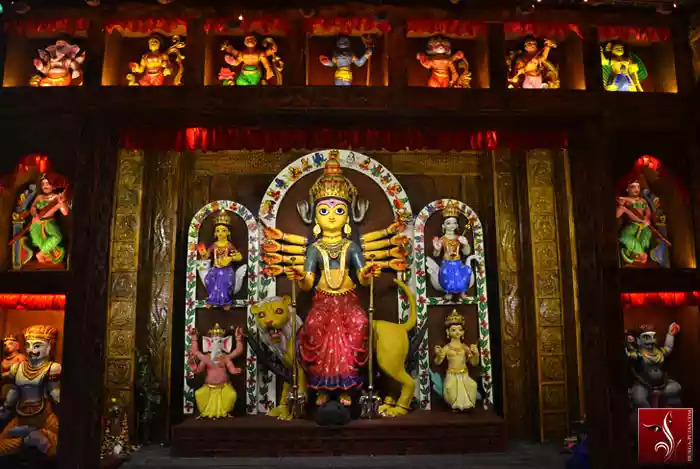 Pandal illuminations have gone from the customary Chandannagar style of tulip-shaped lights on wooden frames, to spectacular theme-based lighting that uses flashing bulbs and animation to depict current events. Another pleasing touch was the elaborate decorations devised from pristine white material known as daaker saaj – so named because it originally came via the post (or ‘daak’) from Europe, until it began to be manufactured locally. Barowari Puja means a puja arranged and organized entirely by the local community. 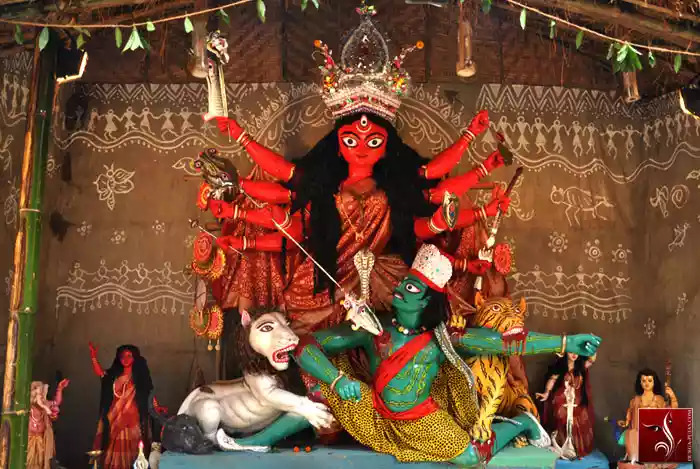 First organized in Guptipara, a place about 100 kms away from Kolkata, such community pujas spread fast through different parts of West Bengal, particularly Kolkata. 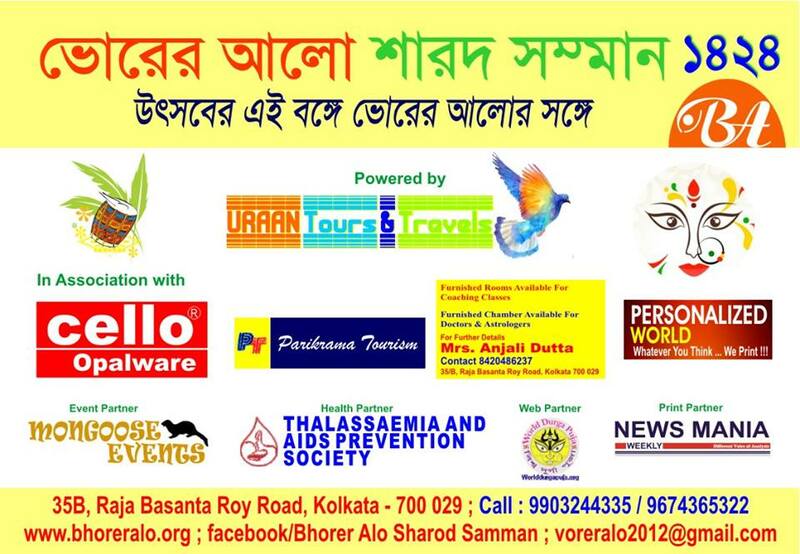 The word Baroaari came from Baro (twelve in Bengali) + yaar (friends), ie, in its amalgamated form a puja organized by twelve friends. Daak-er Saaj is a special kind of gorgeously ornamented outfit of Devi Durga idol, principally made of metallic foils, wires and beads. Initially during the pre-independence period, the foil required to make Daak-er Saaj used to come from Germany by post (Daak in Bengali & Hindi). Hence originated the name Daak-er Saaj. Ever since Asian Paints Sharad Shamman was introduced cultural ambience within and around the pandal was one major criterion for judgment. By the beginning of 1990s, a considerable number of clubs stressed on improving the overall ambience of there puja. It was during that period the organizers of a puja committee of South Kolkata that won successive Sharad Shamman awards noticed that some of the locals, otherwise absent from puja organizing activities, dressed up very decently in traditional Bengali attire showed themselves up at the pandal throughout the night on which the Asian Paints judges were expected to visit. The organizers, thoroughly amused at this exhibition of artificial cultural exuberance, termed it as APmania, where AP stood for Asian Paints (Sharad Shamman). 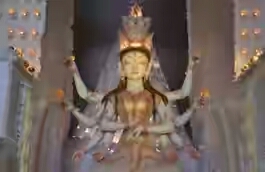 The concept of Durga family in West Bengal is something very unique and does not match with the description or explanation of age-old Hindu religious scriptures. 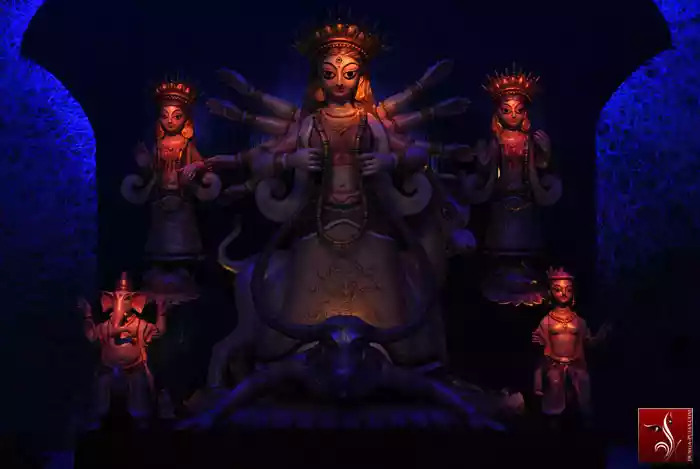 Bengal believes that Durga is the mother of Lakshmi, Saraswati, Kartika and Ganesha (Lak-khi, Sharashwati, Kartik and Ganesh as pronounced in Bengali). Shiva (Shibin Bengali) is Durga’s husband and father to these four children. Durga’s stays in in-law’s house in Kailash ( i.e. 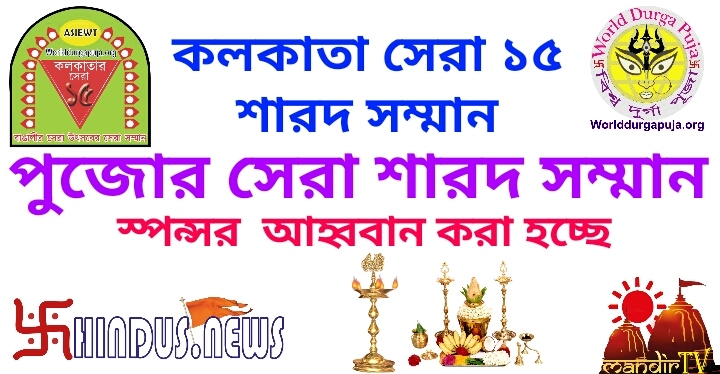 by definition the abode of Lord Shiva) and every year along with her children she comes to Bengal to visit her mother and other relatives for just five days (Shashthito Dashami). On the contrary, most Puranas and other Hindu scriptures indicated that only Ganesha is the son of Durga. Kartika or Kartikeya is obviously the son of Lord Shiva but his birth was controversial as he was claimed to have born inside the tubular hollow of a water weed. Similarly Lakshmi and Saraswati were described to be the wives of Lord Vishnu but never the daughters of Devi Durga. In 1997, on the occasion of 12th year celebration of Asian paints Sharad Shamman, general public were invited to predict the Sharad Shamman winners and a few rewards were declared for the participants with closest correct entries. Shrimati Gargi Dutt was the winner of the topmost reward, the much coveted statuette of the Goddess made of gold. 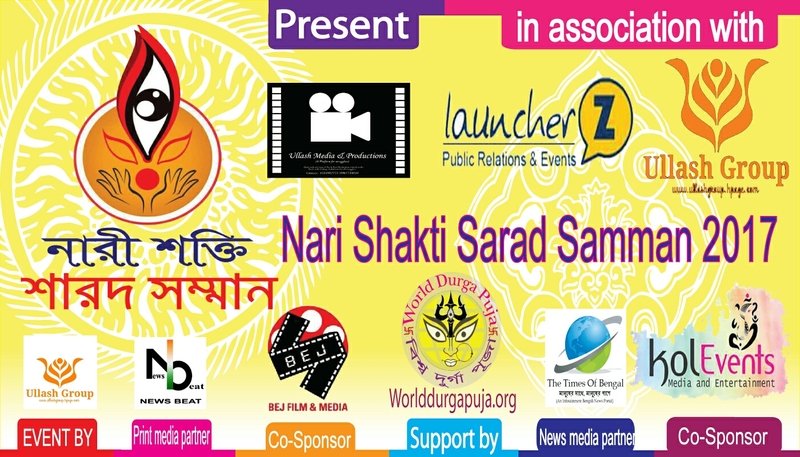 Copyright © 2019 World durga puja organization. All rights reserved.